Pacific University, with the assistance of longtime food service provider, Aramark, will refresh the Washburne University Center and expand offerings in time for the 2014 fall semester. Construction will begin this spring on the soon-to-be new look of the University Center, which will provide significantly more amenities and conveniences to students, employees and guests as part of the university’s ongoing partnership with Aramark. Design and construction of the project will be a partnership between Portland-based firms Opsis Architecture, inici Group, Inc. and Walsh Construction Co. The refresh of the University Center is designed with the students in mind. New paint, carpeting, décor, bathrooms and entryways on the first floor of the building will provide better access and a more contemporary environment for dining and leisure. In addition to the expanded dining and lounge areas, the refresh will also feature an expanded kitchen and food serving stations, as well as a fully licensed Starbucks location. And, the Boxer Bistro convenience store that provides takeout options and other everyday essentials will be altered to take the shape and feel of Aramark’s highly successful Provisions on Demand market concept. Provisions on Demand combines a corner store feel with the style of a modern market, featuring grab-and-go dining choices for any time of day, including breakfast sandwiches, burritos, wraps, salads, soft drinks and snacks commonly found in convenience stores. 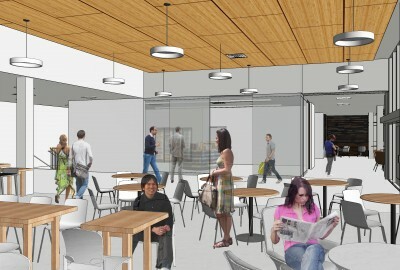 The University Center refresh will also include renovated space for the Pacific University Bookstore, operated by Barnes & Noble, which will move into the east side of the building from its current off-campus location. The refresh is part of a new dining services agreement Pacific has entered into with Aramark following a competitive request-for-proposals process in which bids from three vendors were evaluated by a group of students, employees and administrators. In addition to the building remodel, Pacific’s new agreement with Aramark includes more meal plan opportunities, including an “all-access” option for Pacific students and employees, and expanded hours of service at both the Forest Grove and Hillsboro campuses. Aramark has partnered with Pacific University for many years and is a strong proponent of the university’s commitment to sustainability. Together, Pacific and Aramark donate excess food to area shelters, compost food waste, provide reusable to-go containers and employ a student sustainability intern. Aramark also strives to prepare foods that are raised, grown, harvested and produced locally. The University Center refresh joins the ongoing construction of the new 200-bed residence hall, Lincoln Park complex improvements and other projects as part of the Forest Grove campus transformations taking place this summer.